Thinking about porcelain veneers, but scared silly by the idea of having your teeth shaved down to hardly nothing at all? Turned off by having teeth the shape of white Chiclets chewing gum? (Talking about you, Hilary Duff.) Well, good news. So are we! At Chicago’s Sugar Fix Dental Loft, we are all about conservative dentistry. What is conservative dentistry, you ask? Pretty much exactly what it sounds like: conserving your natural teeth. Sugar Fix Dental Loft founder and owner Dr. Jessica T. Emery has a goal. 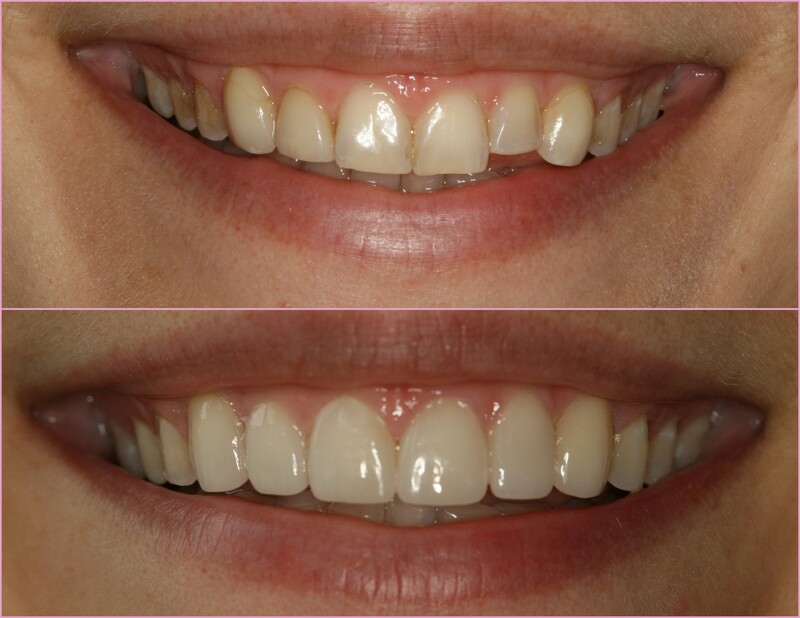 That goal is to keep as much of the original tooth as possible when preparing her patients for porcelain veneers. Dr. Emery has adopted a conservative approach to the procedure of applying porcelain veneers. This means she will never remove more of your dental enamel than is absolutely necessary. If you are concerned with very minor misalignment, Sugar Fix also offers a no-prep veneer option, which typically does not involve any alteration to the tooth's structure. Before you receive veneers, Dr. Emery will analyze your teeth and oral health to determine whether you are a good candidate for the procedure. Following your examination, she can also help you decide whether traditional or no-prep veneers are best for you. If you choose traditional veneers, Dr. Emery will administer a local numbing agent to the teeth and surrounding tissues to reduce any sensitivity and minimize your discomfort. Next, she will remove a very thin layer of enamel from the front of your teeth, typically between 0.05 and 0.08 mm thick. Of course, Dr. Emery will remove less than 0.05 mm whenever possible. The preparation process affects only the outer layer of the tooth. The reasoning behind enamel removal is that it creates a better bonding surface for the porcelain. By removing a minuscule amount of enamel, Dr. Emery is making room for the veneers, thus allowing them to lie flat against your surrounding teeth and gum line for a natural, contoured appearance. Trust us, we will not let you leave our office looking like Mister Ed. After removing the necessary amount of enamel, impressions of your teeth are sent to a lab, where ceramists create customized veneers made to blend seamlessly with your smile. Side note: Does anybody grow up dreaming of being a ceramist in a dental lab? What a crazy cool vocation. Anyway, back to the topic at hand. While you are waiting for your permanent veneers, Dr. Emery may provide you with temporary restorations, which can help reduce sensitivity. Katy Perry's in the house! Just kidding. During the wait period, remember that your teeth will be missing a portion of their protective enamel. No need for drastic changes in your diet, but you may want to avoid extremes regarding food and drink. So maybe skip the extra hot no foam latte and frozen margaritas until you get your veneers placed. It may take a little willpower (Okay, who are we kidding? It will take a lot) to cut out your favorite beverages, but the end result will be totally worth it when your smile attracts the attention of everyone you encounter. Contact Dr. Emery and her team at Sugar Fix Dental Loft today and discover how easy and painless it is to attain a superstar smile.